צילום: אאודי R8 ספיידר בישראל: אייל מן. בדיוק שנה לאחר חשיפת אאודי R8 GT קופה שנחטפה באחת ע"י הלקוחות. בזמן שאתם נעים במהירות של עד 50 קמ"ש. ומשם להאיץ עד המהירות המרבית בת 317 קמ"ש. 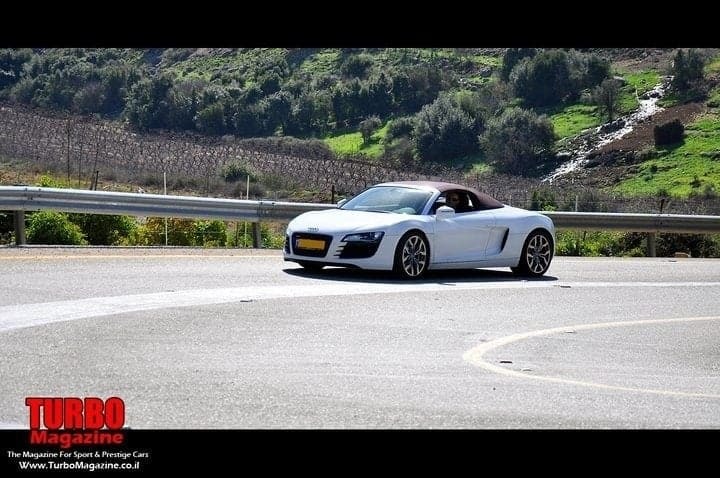 גם אאודי R8 V10 FSI GT ספיידר תיוצר בכמות מוגבלת של 333 יחידות בלבד. ושייכת לקורא טורבו מגזין. 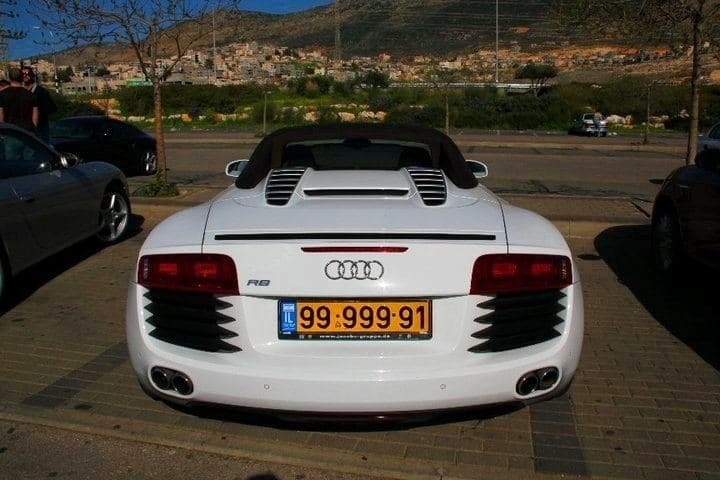 היא בגרסת 4.2 V8 .ראו תמונות מצורפות. 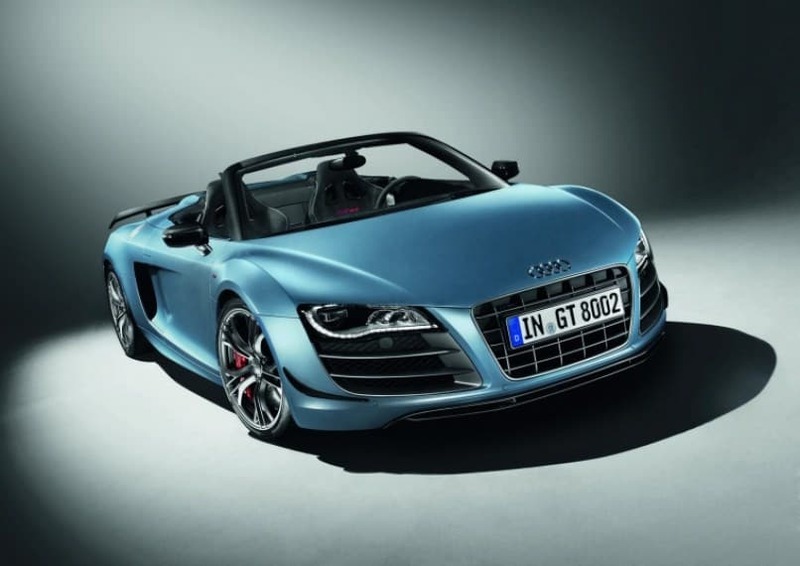 Even lighter, even more powerful, even more captivating: The Audi R8 GT Spyder delivers breathtaking performance. The open-top flagship version of the high-performance sports car develops 412 kW (560 hp) and - thanks to Audi ultra - has trimmed a full 85 kilograms (187.39 lb) from an already low weight. 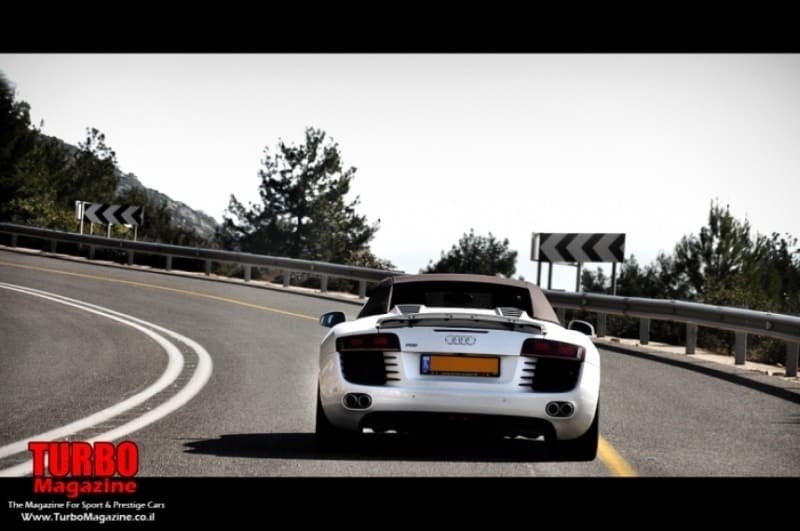 The R8 GT Spyder accelerates from zero to 100 km/h (62.14 mph) in 3.8 seconds and reaches a top speed of 317 km/h (196.97 mph). One year ago, Audi unveiled the R8 GT in coupe form as the new flagship model of the R8 model line. It wasn't long before all 333 units in the limited series were sold out. Now the open-top version of the high-performance sports car is being launched, with production again capped at 333 units. Each car sports a tag with its individual number on the gear lever knob. 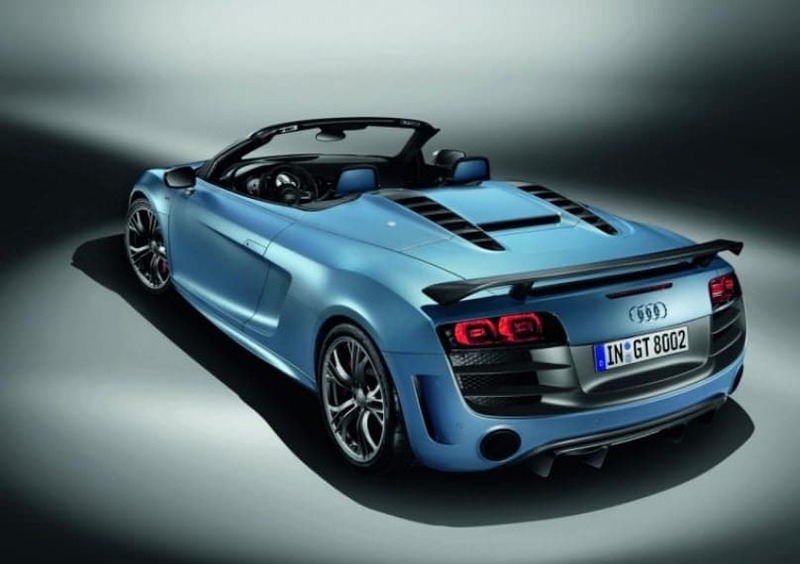 The Audi ultra lightweight technology is the key to the R8 GT Spyder's weight of just 1,640 kilograms (3,615.58 lb). That's 85 kilograms (187.39 lb) less than its technical basis, the R8 Spyder 5.2 FSI quattro. The Audi Space Frame (ASF) body, consisting of cast nodes, extruded sections and aluminum panels, accounts for just 214 kilograms (471.79 lb) of the total weight. The body is assembled predominantly by hand in the R8 workshop at the Neckarsulm plant. Final assembly of the car takes place in the same way. 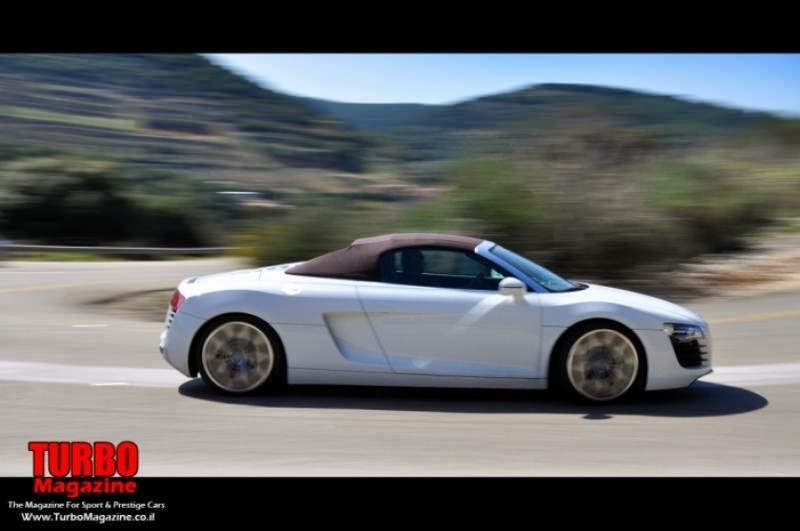 The R8 GT Spyder catapults from zero to 100 km/h (62.14 mph) in 3.8 seconds and reaches a top speed of 317 km/h (196.97 mph). In every situation, the engine impresses with its thrust and bite - and that unmistakable sound of an Audi ten-cylinder. The interior is black and can be adorned with stitching in a choice of titanium gray or crimson for added refinement. Alcantara upholstery comes standard - on the sport steering wheel and windshield frame, too. Audi also offers leather in Fine Nappa quality. Numerous details - including white dials and R8 GT logos - provide classy accents. The distinctive R8 "monoposto," a large arch encircling the driver's cockpit, is made of matt CFRP.